If you have SSL certificate, you can configure your connection to be more secure using standard security technology to establish an encrypted link between the server and RDP. This link ensures that all data passed between the server and RDP remain private and integral. This option is ideal for smaller deployments that don't have more than 1 session host server. 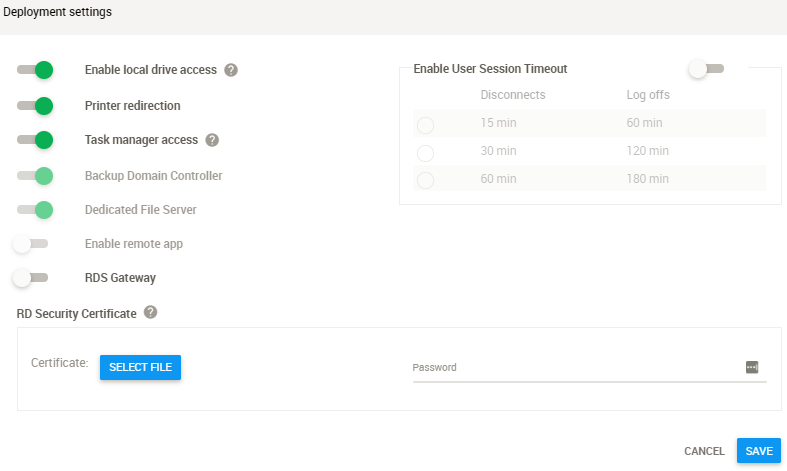 For bigger deployments, you can enable RD Gateway that will work as a bouncer for all the connections before they for the the session host. You will get the setting screen where you can enable RD Security Certificate. Browse for the certificate in your local PC and provide the password. Hit Save. Then, the certificate (with private key) has to be imported into the personal store of the local machine. Once you have the Thumbprint value paste it in a notepad and remove all the spaces between the characters. Once these steps are completed you should no longer get any SSL warnings when connecting to your remote server. Please note the cert used above is a wildcard (*) and will not work for your domain. In the case of a partner the ssl that needs to be used is for whatever domain was selected during provision.